When working with lists of data you sometimes need to work through the duplicates to decide which you can leave and which can be deleted, or alternatively which need to be investigated for reconciliations. This can be a tedious process involving lots of sorting and unsorting. 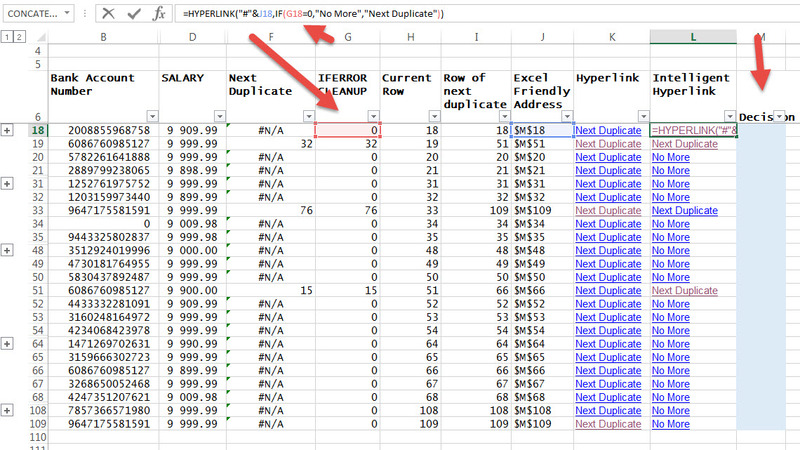 Below we have shown a way to goto the next duplicate in Excel list using hyperlinks. As shown below some bank account numbers from a payroll. 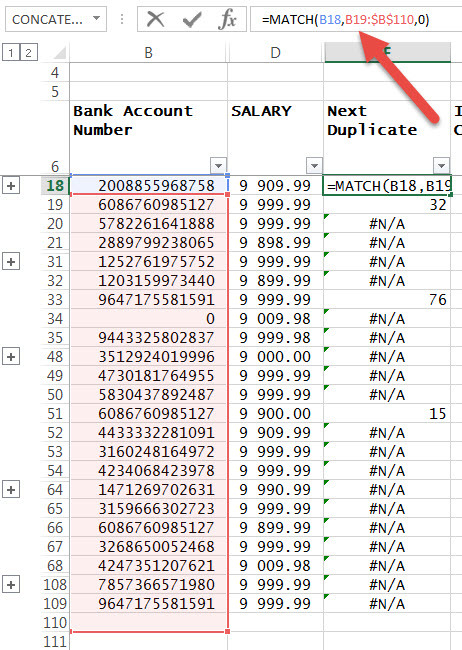 We need to check why there are duplicate bank account numbers in the payroll. Some might be legitimate in that it is a joint account but some could be phantom employees! If you look closely you will see some duplicates but even in this small list it is hard to spot. To do this we can use the MATCH function. It will either return a number e.g. 32 or an error message meaning that it couldn’t find another duplicate. 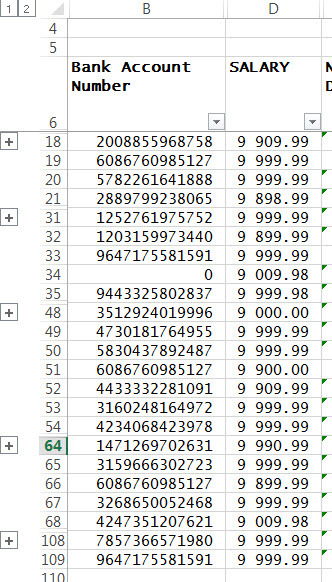 The number means that is how many rows you must go down from the current row to find the next duplicate. To make it neater in column G we have just put an IFERROR in to show a 0 if there are no duplicate or the number of rows down where the next duplicate is. We now need to know what row we are currently in (you will see why in the next step). 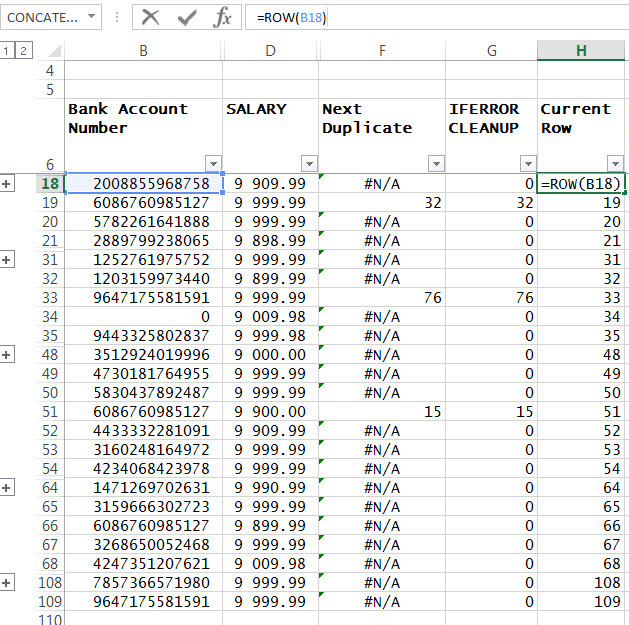 The function to use here is the ROW function and all you need to do is point to the cell. 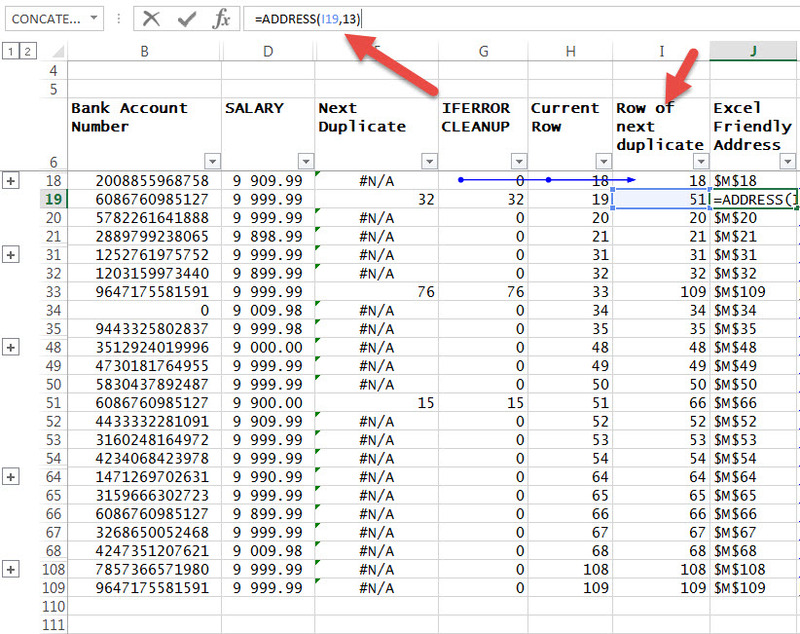 In column I we have just added up the ‘Current Row’ column (H) and the ‘Row of next duplicate’ column (I) to figure out on which row of the sheet the duplicate occurs. 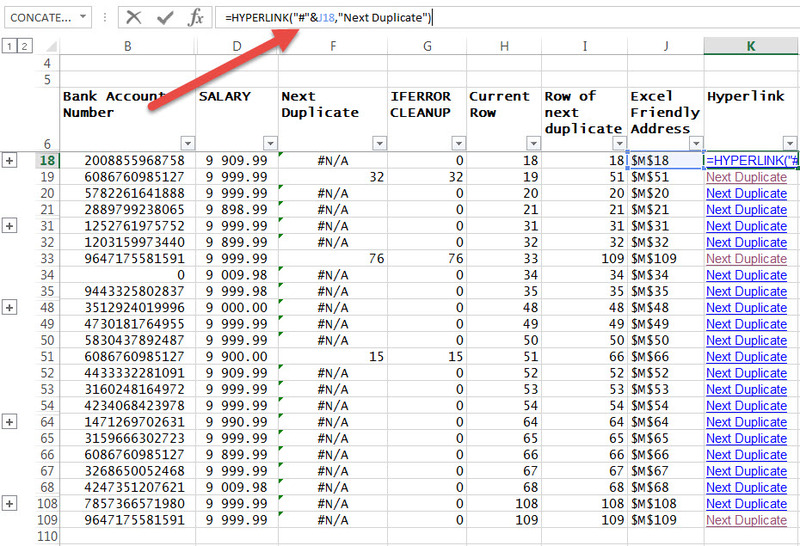 The HYPERLINK function is great for helping with navigation around a spreadsheet. In this case we want to create a link that will jump to the next duplicate of that particular row. 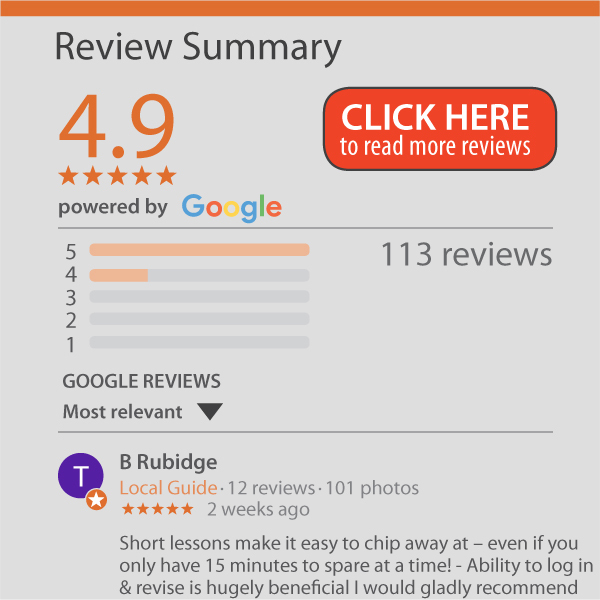 The HYPERLINK function is relatively easy but with one trick. Note that we have refereed to the address column in column J but we appended a ‘#’ to it i.e. “#”&J18 in the example below. If we don’t do this Excel doesn’t know which spreadsheet to look in (hyperlinks typically have the full path). By putting the # in, you are telling it to look in this sheet. At the end of the Hyperlink we put a friendly name we want to appear, in this case ‘Next Duplicate’. You can stop at this point and start to use the hyperlinks. When you click on a hyperlink it will take you to the next duplicate. If there is no duplicate it will stay where it is. Note below in column L we have changed the HYPERLINK formula so that, if there is no more duplicates (as indicated by a zero in column G), then it must say ‘No More’ , otherwise say ‘Next Duplicate’. We have also added another column M called decision. This is where the hyperlink jumps to (column 13) and you can now enter what your decision is regarding that duplicate e.g. OK, Check, Delete etc. At the end then you can use the FILTER to extract or delete the items you are looking into.